Sam Crawley's Little Box on the Web: Randy at the Warrington? At one end of my street, where Randolph Avenue meets Sutherland Avenue, sits the Warrington Hotel, which has never been a hotel, but is in fact a pub, recently purchased by Gordon Ramsey and given the Gastro make-over. It's a beautiful building with an interesting interior. I haven't tried the food but the beer is well-kept. 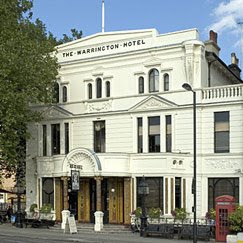 Located on the leafy corner of Warrington Crescent and Randolph Avenue in Maida Vale, The Warrington is an ornate Victorian pub that has been given the glossy Gordon Ramsay treatment. Now it's a posh gastro pub serving classic British fare, but back in 1857 the boozer used to be a famous brothel. So famous the saying “feeling randy” comes from the restaurant's location on Randolph Avenue. Yes, apparently I live on the street which gave rise (ooh,err) to the term “randy”! I will make no further comment!